Emily and Enron love each other and want to be together. But Enron is hiding a terrible secret – he is the son of Dracula. And just as Enron wants to tell Emily the whole truth about himself, she is kidnapped. No one knows where she is. But there are all the signs that she was abducted from her apartment against her will. Meanwhile, Emily wakes up in a gloomy room with numerous coffins and the ghost of a little girl tells her that Emily has to hurry in order to be rescued. So Emily and Enron must hurry to find each other. But can they do this? You will learn this from the game Dark Romance: Vampire In Love. 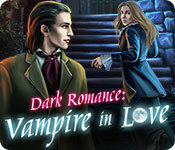 Dark Romance: Vampire in Love is rated 3.7 out of 5 by 21. Rated 5 out of 5 by SparkleGlow100 from LOTS of yummy HOPS! What an enjoyable game! I loved these graphics. I prefer these none cartoon-type. The story was interesting, and the characters had depth. Lots of details in the surroundings. No lull in the tempo of the game. LOTS of HOPS, some interesting puzzles. Rated 5 out of 5 by tailswhiskers from A good Halloween game This is different type of game in where you can play 2 different people at different times in the game. I like vampire games. You start out as one person then you change to the other during the game. Rated 5 out of 5 by shehar39 from Lots of HOS to keep game going I enjoyed this game. It had alot of HOS which I like playing, It had a map that i could refer to when i needed to know where to go next. You got to click back and forth between 2 characters that kept me interested. And i like having a little Romance interjected into the story every time. Rated 5 out of 5 by pennmom36 from Love At First Bite! Nothing better than playing an adventure game, especially when you can relate to the character. This is one of the few games in which you get to be BOTH characters! In order to progress further into the game, you will switch between the Bride and the Groom! The Groom just so happens to be a Vampire, not just any Vampire but Count Dracula's son, and he's not at all happy with his son's decision to wed a mere mortal! (that seems like an easy fix right?) This is a fantastic concept allowing you to "see" the game from two separate perspectives, the anxious Groom who must search for his missing Bride, (hopefully before it's too late), as well as the ever so nervous Bride, who fears for her life. Personally I chose the Collectors Version because there are hidden bats throughout the game to collect that can be used to upgrade your castle with greenhouses, fountains and other miscellaneous decorations. You will also find garlic in the Collectors Edition, which can be used in the interface shop to purchase upgrades to customize the inventory panel, the journal and even the character cameos. For some strange reason I loved it (I can almost smell the roses!) There are also 15 items to find that give you a tidbit of information as to how that item relates to a Vampire. 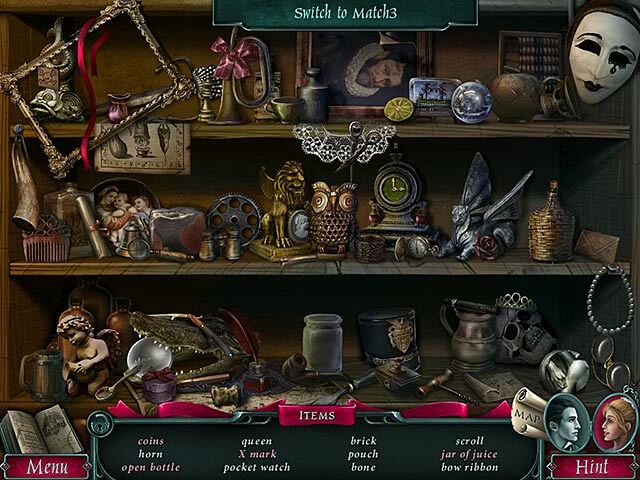 The Hidden Object Scenes are very nicely done, with interactive list finds and very well hidden items. You can choose to play a match 3 game instead which has skulls, blood drops, wooden stakes and clovers. Some of the scenes are repeated which is a feature I do not like, but nonetheless, they are there to stay. 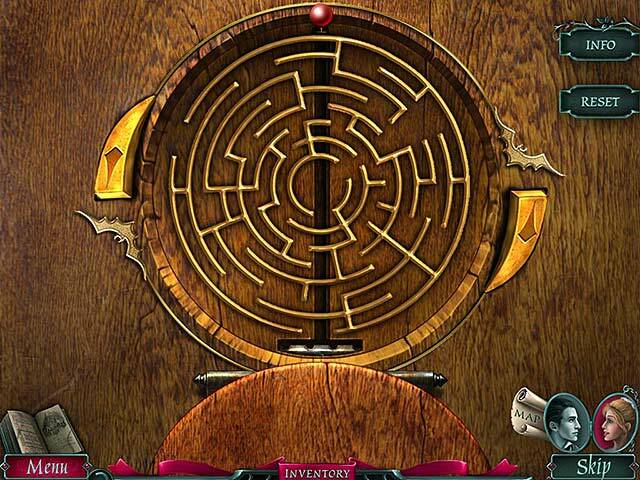 The mini games are decent, several require you to refer to the journal for clues on how the puzzle works. For example the journal shows 4 color coded numbers and 5 color coded roses, you must place the correct color and number of roses on a door panel to open the door. I also liked the puzzle that required you to take away 4 sticks but you had to make sure there were 4 exact triangles left. Enjoy! Rated 5 out of 5 by condorcandi from No damsel in distress here! This game is deep, engaging, and gorgeous, with excellent gameplay. I *love* that the girl, instead of sitting shivering waiting for the hero, gets up and out and actively helps with her own rescue, in addition to helping someone else along the way! Very satisfying. I highly recommend purchasing the collector's edition; it adds a depth to the story the main game doesn't give. If you do, don't look at the achievements possible before playing the bonus chapter; two of them are spoilers for the ending. 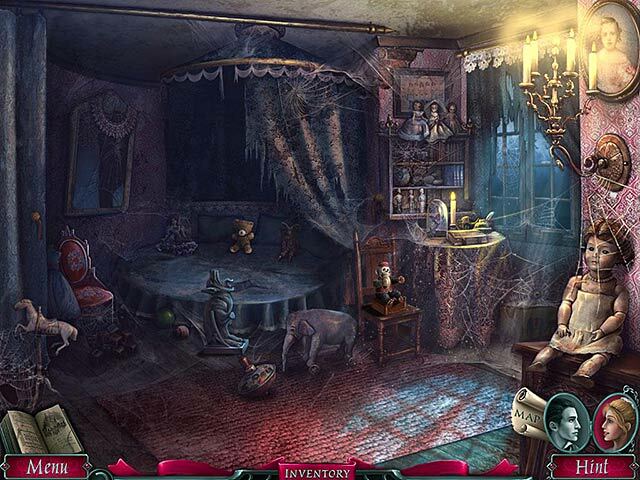 Rated 5 out of 5 by BlackWaterRules from Dark and Eerie Hidden Object Thriller The storyline is excellent. Count Dracula, the most evil and cruel vampire has a son named Enron, who decides to turn his back on his father and live among humans. He falls in love with Emily, a human woman. Dracula soon learns that Enron and Emily are to marry and kidnaps Emily to turn her into a vampire and bring Enron back into the fold. You play two characters, going back and forth between Enron and Emily; Emily trying to get out of the castle, and Enron trying to save her. You receive clues from each character. The soundtrack is great, full orchestra with music that is spooky, eerie, and ethereal. Narration is very well done as are the voice overs. The graphics are well done, beautiful illustrations, in full color. Hidden object scenes are interactive list type with objects very well drawn, crisp, and clear. Most mini puzzles are relatively easy. I had to skip two of them after spending ten minutes on one and eleven minutes on the other. There is a diary and an interactive map to assist you. This one is a keeper. Rated 5 out of 5 by rosekaufmann from PLAY AS TWO CHARACTERS You have to play as both characters - change characters by clicking on the other. Fun game to play, even without the collections. You can select the normal 3 modes of difficulty or customize your own level. Music and graphics are good. Scenes can be somewhat crowded and, since you frequently get a view of rooms from one point, the items in the rooms can be a little smaller than from a close-up. SUMMARY: Good production values and well executed gameplay. The CE seems to be the way to go with this game if you like achievements, collectibles, and collecting items to purchase decorations for your castle and panel. Rated 4 out of 5 by mouser9169 from Play as two protagonists through this vampire tale Mostly copied over from my review of the CE: The games comes to a full, if a bit abrupt, conclusion, so you don't get cheated out of an ending by not getting the CE. You miss collectibles, about an hour or so of additional play, and a 'twist/choice' ending in the bonus by not going the CE route. THE GOOD: Graphically, it's solid, voice overs are well done, and you get customizable options for hint/skip, sparklies, and tutorial. You have a choice of Match-3 or HO. The match 3 isn't insultingly simple either, so you have a nice bit of fun either way. A few 'interactive' objects in the scenes, but nothing really new going on there. Well drawn though, so you can generally see what you're looking for (no black on black in shadows...). The 'cool' feature for this game is the ability to switch between the two protagonists. You progress so far as one, then you hit a wall, and need to play as the other to pass the block. I've seen the concept done before in handheld console games, and they carried it over fairly well here. I think Emily's portion got better treatment than Enron's though, so I ding them a bit for that. The puzzles are the games best feature. The run the gamut from simple to very complex. Most are variations on common themes but there are a few they put some twists on to up the challenge level. THE BAD: Music gets repetitive, especially the 'jump' swells. The journal 'reveals' as you go, which means you can get info in your journal your character wouldn't know yet (like quests from characters you haven't met). THE UGLY: A few missteps in the subtitles, and some objects flag as interactive in the HO scenes even when they aren't on the list (scenes are repeated with different objects). Those are minor things though - not nearly enough to detract from the game. Bottom line: It's a solid title. The story is nothing really new, but the mechanics are a nice twist. The puzzles will keep you engaged, and the HO scenes aren't overdone. Rated 4 out of 5 by dancemom1 from Nice as an SE, different game play... I gave the CE demo a try when it came out and didn't particularly care for it as a CE. As I have said many times before, I often change my mind when the SE comes out and I have a chance to replay the game. However, I do not buy the CE. That said, I do like this game as an SE and I am going to use a credit to buy it. The graphics are fairly clear and game play is good, no problems at all. The music left a lot to be desired. It needed to be a little creepy and not so over-powering and annoying. You have a very helpful jump map. I especially like the way you get to play both of the main characters in this game. Their face will glow when you need to switch to that person. Very different and interesting way to play. HOGs are still cluttered and items difficult but not impossible to find. You can switch to a match 3 game...not my favorite thing. There are really a lot of puzzles, but they are simple to figure out. Hint system is very helpful and fills at a fairly fast rate. It also ties into the jump map, as when you need to go to a totally different location, it shows the map and where you need to go. Well done. There are voice overs, but very few. Mostly, you read a lot of dialog, which can be skipped or clicked through if you read faster than they do. Since this is not a CE, it does not have collectibles. Wouldn't it be nice to have another nice SE with collectibles? The name of the last one escapes me, but it was quite fun. As I said, I am going to get this one today. The story isn't new, but the game play is and I find it fun. As always, try it for yourself and see what you think. We all have different tastes in games and you may not care for this one at all. Thanks for the review.